Tebery 2 Pack Stainless Steel Universal Double Boiler, Baking Tools, Melting Pot for Butter Chocolate Cheese Caramel Bonus 1 Plastic Scraper by Tebery at Baking Love. MPN: Te-DoubleBoiler-2pcs. Hurry! Limited time offer. Offer valid only while supplies last. Stainless steel melting pot, is a perfect item for your baking and cooking time. Scientific Designed details bring you convenient cooking experience. 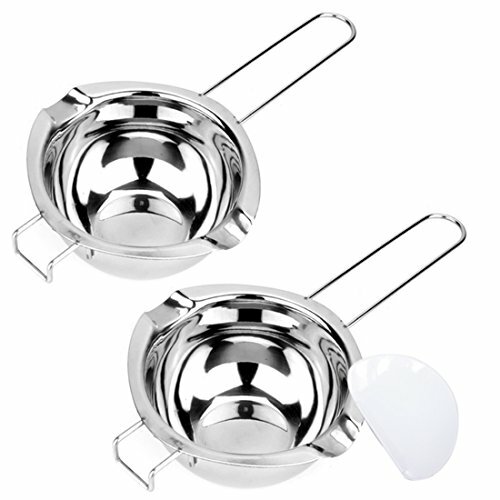 Stainless steel melting pot, is a perfect item for your baking and cooking time. Scientific Designed details bring you convenient cooking experience. Multi-usage, it will appear frequently in your house and you would love it. Made of stainless steel, rust resistant, sturdy, more healthy. Dimensions: 10.2(L) x 5.6(W) x 2.1(H) Inches( 2 cups capacity). Suitable to steam or melt small amount of foods. Perfect for melting butter, cheese, caramel, chocolate, etc. Front hook to prevent sliding away, double pour spouts both sides, flat bottom. Easy to use. Cook with gentle steam with this endurance double boiler insert. Hand washing recommended, great gift for friends.